These cuirasses were much more effective at deflecting a blow from a spear, sword, arrow dart or stone, all which were employed by the ancient Greek warriors. 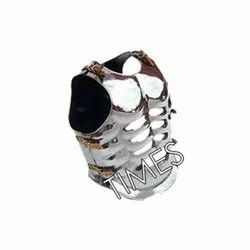 Made as a set, the breast and backplate are adjustable with two straps and buckles at the sides and one at the shoulders. One size fits most body types. 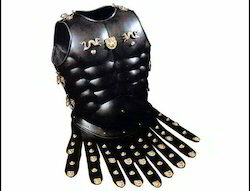 ROMAN 2 PIECE BODY ARMOUR: Constructed of 16 gauge polished carbon steel. Complete with leather straps. Weight: 9 lbs. Height: 20" Size: 40-46, Weight: 9 lbs.